Japanese Tea Story : Green or Black?? Recently, a controversial issue has brought up. 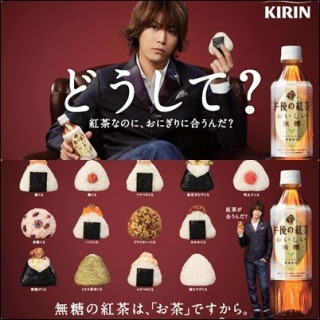 "Does onigiri (rice ball) go well with black tea? " ﻿Ongiri is a simple and handy Japanese food made from white rice formed into triangular or oval shapes and often wrapped in nori (sea vegetables). Traditionally, an onigiri is filled with salty ingredient such as ume (pickled plum), salted salmon, katsuobushi (soy-sauced flavored dried bonito flakes). Japanese have never doubted that Japanese green tea is a perfect drink with onigiri. However, a Japanese beverage company, which has recently put their new bottled “black tea” on the market, cast a question about it. "Don’t you think onigiri is also good with black tea?" Actually, its taste has changed. Being really popular, the handy food with much wider variety of fillings and flavors are seen on the market. Even cheesy or meaty stuff, which were not conventional, are used as fillings. So, it makes sense the drink to go with doesn’t have to be “conventional”. To begin with, tea is tea whatever “color” is. With its “advent” of onigiri’s novel flavor, why don’t we try new marriage?